You can ask the user to add inputs through the GUI before a stack is built and use their values in your stack. 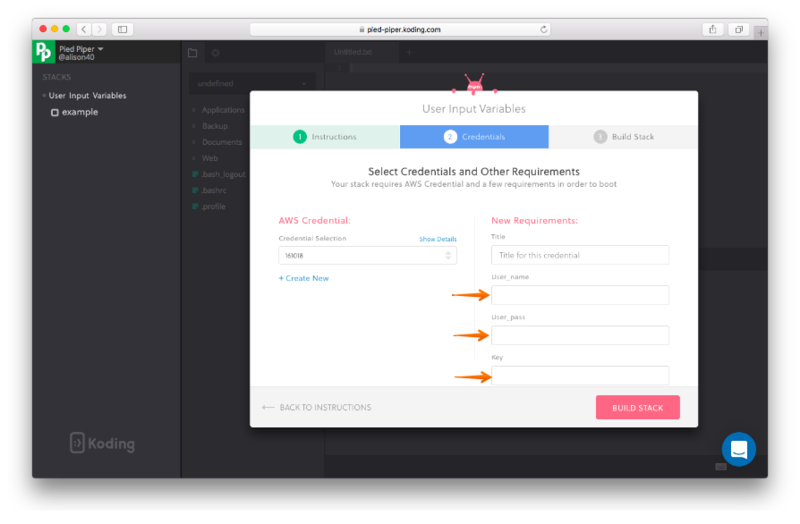 In the above example we are asking our developers to enter three values user_name, user_pass, & key. These are defined under the user_data section in our example, but you can use user input variables in any area in your stack template. Once a developer builds this stack, they will be prompted with a GUI box asking to enter the values for the above three variables as seen below. In our example when the stack is built, we are only displaying the values the user entered. However you can see a more practical example in our GitHub guide. Congratulations, you can now make use of user inputs in your Stack template.